A few years ago, Corey Osgood ran cross-country at Montford Middle School in Tallahassee, Florida. Fewer years ago, Caitlin Wilkey ran cross-country at Montford. Montford happens to be right next door to Roberts Elementary School, so it was almost a homecoming on Saturday morning, 27 January 2018, when Osgood and Wilkey raced in Roberts Elementary's ninth annual Trent Trot 5K. 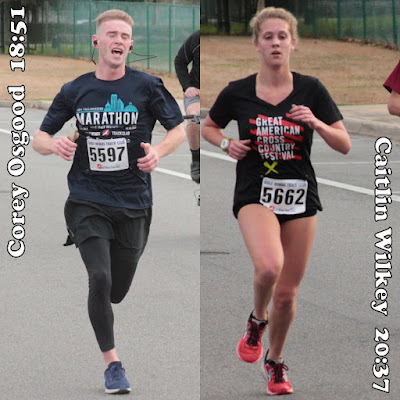 You could even call it a homecoming celebration, because Osgood won the race in 18:51 and Wilkey took the women's title in 20:37, placing fifth overall. It was Wilkey's second year in a row as women's champ of the Trent Trot. Elijah Blay, a frosh cross-country runner at Chiles High, was second in the race in 19:17. 15-year-old Peter Failma of Tallahassee took third in 19:57. Brian Corbin, a Montford teacher, was the fastest master runner in the race, placing fourth overall in 20:03. Tylo Farrar was second to Wilkey in the women's standings, placing fifteenth overall in 22:39. Kate Chunka was the third woman and seventeenth overall in 22:43. Mary Vancore was the top woman master and tenth female finisher, 46th overall in 26:03. 366 athletes finished the 2018 Trent Trot 5K and another 200 completed a one-mile fun run. Gulf Winds Track Club of Tallahassee, Florida chip-timed the races.